Quality & style! There are over 25 ways for you to customize your P36 Fireplace. The P36 is the only Panorama that allows you to choose a slim or deep fire. Your room will be enhanced with the warm glow of a slim fire. If space allows, select the deep fire and enjoy viewing a larger fire area. 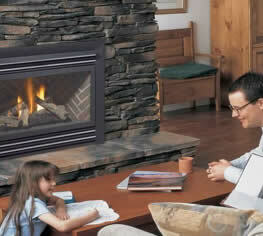 Enjoy quality time with friends & family by choosing a quality fireplace.